PDF is a file format created to make it easy to represent documents across hardware, software, and operating systems. It is available as an open standard for fixed-layout flat documents that include text and graphics elements. The PDF patents are owned by Adobe Systems but the company allows free use of the format so anyone may develop applications capable of reading and writing PDF files without worrying about royalties. There are three technologies integrated in the PDF: a subset of the PostScript page description programming language (to handle graphics and layout), a font-embedding system (to enable the reading of different types of fonts), and a structured storage system that may use data compression where applicable or appropriate. To make use of PDF files, PDF software are needed. There are five major types: creators, viewers, converters, editors, development libraries, and web-based PDF software. In many cases, these software incorporate multiple functions in one bundle. Featured below are some of the best software for working with PDF documents. DigiSigner is an application created to view and digitally sign PDF documents. It is available in free and pro (paid) versions. This proprietary program can be used on Windows, Mac OS X, and Linux computers. It is implemented with Java technology so it should be usable in devices where Java is installed. 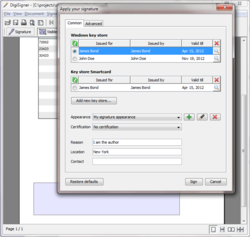 DigiSigner can quickly view PDF files and generate digital signatures on them through X.509 certificates. The digital signatures can either be visible or invisible. Visible signatures may be created in any part of the document. Multiple signatures may be created. DigiSigner can verify and display information about existing visible signatures. 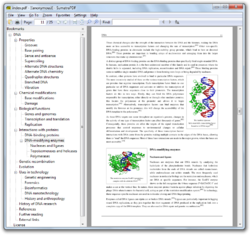 Foxit Reader is a PDF reader with multilingual support available in both basic and full versions. This quickly loading reader has a noteworthy small file size and is considered to be comparable to the Adobe Reader. It runs on the Windows and Linux platforms. The Windows version is capable of annotating PDF documents, creating highlights and simple drawings, saving PDF forms that are yet unfinished, and the exporting and importing of PDF content into text. The windows 2000 and XP versions also support the U3 smart drive. The Linux version is not as full featured as the one on Windows. This open source PDF viewer was developed by Foo Labs and is intended for the X Window System and Motif. It is a cross-platform PDF viewer capable of decoding LZW and viewing encrypted PDF documents. The software can include additions that may remove images to convert the text component into text or PostScript files. Xpdf may be employed as a back-end for other applications for reading PDF documents like GPDF. The software is available in two versions for the AmigaOS. The latest stable version is version 3.03 released in August 2011. 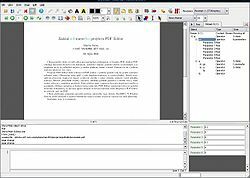 PDFedit is a free PDF editor developed for Unix-like operating systems. It is available under the GNU General Public License. The graphical user interface of the software is based on the Qt 3 toolkit and scripting engine. This means that every operation can be scripted. It also supports scripting in ECMAScript. It includes a command line interface for PDF manipulation. However, it does not have support for encrypted PDF file editing. It also lacks text manipulation capabilities similar to those of word processors. PDFedit is designed as a low level tool with just enough features and structured access to PDF document components. PDF Studio from Qoppa Software is a cross-platform PDF editor developed in Java. It is a proprietary program capable of creating, reviewing, annotating, and modifying PDF documents. The program is available for Mac, Linux, Windows, AIX, and Solaris computers. The program has support for current ISO open PDF specification. Some of the notable features of the software are the ability to fill interactive PDF forms, review and produce annotations on PDF documents, create digital signatures, modify the contents of a PDF document, and add watermarks, headers, footers, and bookmarks. Additionally, PDF Studio can merge, split and assemble PDF documents. It can also secure PDF documents with passwords. 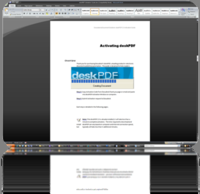 deskPDF is a suite of commercial PDF software from Docudesk. It is intended for creating PDF in Windows. It is available in a number of variants namely, deskPDF Standard, deskPDF Professional, deskUNPDF Standard, deskUNPDF Professional, deskUNPDF for Mac, and PDF Essentials Plus. deskPDF employs PostScript technology to enable the creation of PDFs out of printable documents. It supports the OSI 1.6 Portable Document Format standard. DeskUNPDF does the opposite of what deskPDF does. It can ”un-PDF” portable document format files by converting them into editable formats like RTF and DOC. Sumatra PDF is an open source PDF reader that features a minimalistic design capable of opening EPUB, CHM, CBZ, CBR, DjVu, and MOBI files. It is one of the fastest PDF software and is designed for portable use with no external dependencies. It does not lock PDF files so users can make changes on the PDF documents. Sumatra PDF supports the embedding of hyperlinks, multiple languages, and the SyncTex method for synchronizing TeX source and PDF output. This free proprietary PDF reader for the Windows platform was developed by Tracker Software Products. It comes with a rich set of features including the ability to highlight, insert callouts and notes, and type in texts. It provides support for the saving of filled PDF forms and their exporting or importing in FDF/XFD formats. The software also makes it easy to set metadata for a PDF document. PDF-XChange Viewer may be installed with the PDF-XChange Lite print deriver to enable the generation of PDF documents from MS Office applications. This adds the option to “print to PDF” documents created with Windows applications. 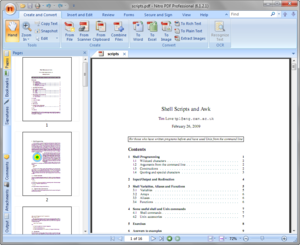 Nitro PDF is a PDF creation, viewing, and editing software designed for the professional market on the Windows platform. It is classified as a commercial desktop publishing software developed by Nitro. Some of its noteworthy features are the ability to convert PDF documents into MS Word and Excel formats, web browser integration, the ability to use and manipulate PDF forms, and the generation of document signature stamps. It can also insert comments and markups to PDF documents. 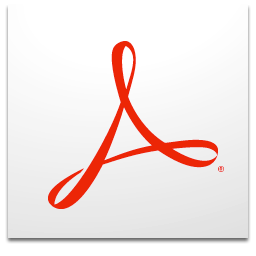 Formerly known as the Acrobat Reader, this program is intended for viewing and printing PDF documents. Adobe Reader is known as the standard for PDF reading. It is available in desktop and mobile versions. The desktop version has had 10 updates or a total of 11 editions. The newer readers have been optimized for the mobile platform and for computers that make use of touch displays. Adobe Reader is already available for Android, iOS, and Windows 8 devices. The program is also available in different language versions including Chinese, Japanese, Korean, Turkish, Russian, Czech, German, Arabic, Hebrew, Polish, Portuguese, Romanian, Swedish, and Spanish.